The Pound closed the week very strongly, after the UK Parliament rejected again PM May's Brexit deal. The GBP/USD was extremely volatile as market sentiment was mixed after contradictory headlines flooded the news feeds. But PM May insists that is either her deal or no deal. The UK Parliament will decide whether to pass or not May's deal this week once again. There are no UK economic data releasing today. 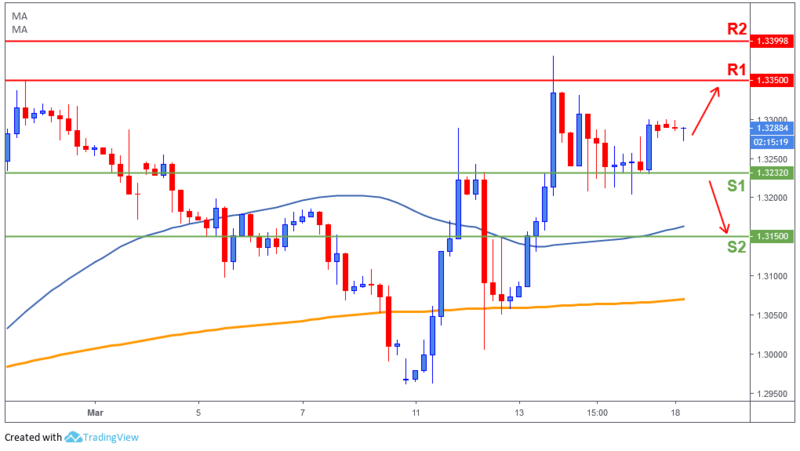 The Pound found support at 1.3230 (S1) and pushed the price higher after it encountered a minor resistance just below 1.33. If this bullish momentum continues we could possibly see a 1.3350 (R1) retest. However, a break below 1.3230 (S1) could likely take price towards 1.3150 (S2).